Radium levels exceeding the DNR limits of compliance detected in the City of Princeton's water supply, specifically in Wells #1 and #2, necessitated a mitigation solution. USDA Rural Development funding acquired for the City by Kunkel Engineering, a design, plan for and installation of a Radium Treatment Facility for Wells #1 and #2 was undertaken. The design and construction of the Radium Treatment Facility was Phase 3 of the three-part community infrastructure upgrade and revitalization funded by that USDA Rural Development money. A Layne OX Hydrous Manganese Oxide (HMO) system that treats 75 percent of the water pumped from Wells #1 and #2 for radium removal was installed. The HMO system treats approximately 600 gallons per minute from these wells and provides pre- and post-chlorination of the water supply with sodium hypochlorite. 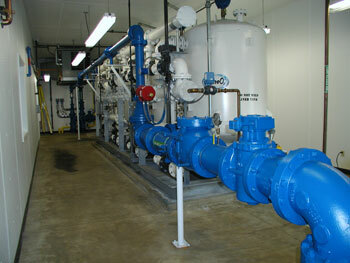 The water system was further integrated into the City's existing SCADA system as part of this project. The new design uses the most cost effective radium removal process in the LayneOX HMO and provides a 20-year lifespan, to 2025, and a supply capacity of 50,000 people.